(L-R) Jennie Mallozzi holds Steven Capistran, Michael Ganney, U.S. Army Sgt. 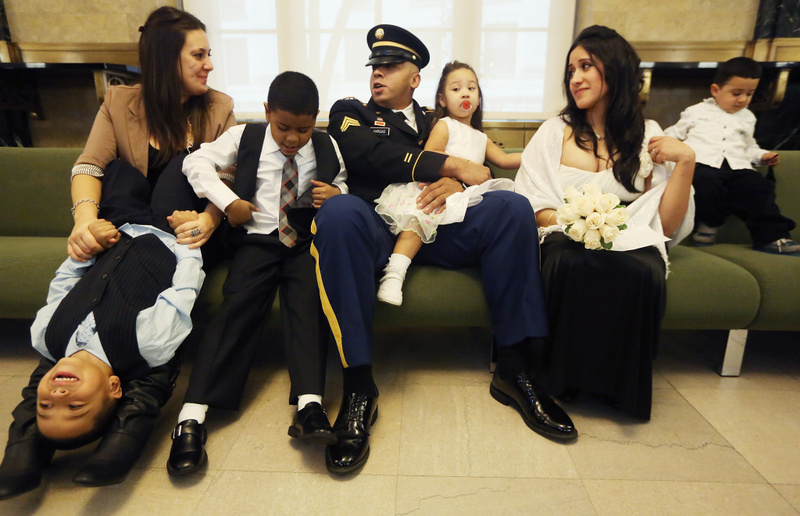 Jamie Vargas holds daughter Hailey Vargas, soon-to-be wife Bernice Vargas and Tyler Capistran look on at the Manhattan Marriage Bureau inside the Office of the City Clerk as they await the Vargas wedding ceremony on October 26, 2012 in New York City. The Center for Investigative Reporting has compiled data to illustrate the extent of the problem. Aaron Glantz, a reporter with CIR, joins the show with more.